At first I wanted to dismiss the quote as being an overstatement of mobile’s popularity but the more I thought about it the more powerful this statement is. What happens when mobile is the only channel (or at least the primary channel) for your business? Web, email, calendar invites, documents and even phone calls need to be designed for a mobile only customer. Whilst many websites and email templates are now utilising responsive design, have they truly been designed for a mobile experience? Are forms easy to use with thumbs only? Is it easy to move around the site without opening “hamburger” style navigation menus? It seems this is an area B2B needs to catch up on. Particularly when it comes to sending brochures, proposal documents and presentations. Are they optimised for a mobile experience? Perhaps now is the time for businesses to shift to responsive HTML as the format for client documents and presentations. Similarly, I’ve watched colleagues struggling to access a conference call from a mobile device as they shift between a calendar invite and the call to enter in the access code. Another thing that needs redesigning in a world where the phone and calendar share the same screen. Having your own app sounds like a vital necessity to support existing channels. Obviously the app needs to be well-designed and provide the same functionality as any other channel. There can be no weak channel. The further consideration is to make use of the full app eco-system as additional channels into your business. This may be the use of social apps (Facebook, Twitter, Pinterest) for education messaging or the utilisation of popular productivity apps (DropBox, Evernote) that will make your business easier to interact with for employees and customers. An example would be allowing a banking customer to integrate their DropBox account with their bank statements to receive copies of important communications straight to a folder. Payment, NFC, GPS, Bluetooth, video playback, biometric fingerprint scanning, push notifications, video chat, and the inbuilt camera are all important features of modern smart phone platform. Each of these features can be enhanced with geographical/physical elements to interact with a mobile experience. This may be augmented reality, QR codes, iBeacons or NFC chips. Make use of all these platform features as part of your customer experience. I’m old enough to remember using floppy disks for storage and having to spend a significant amount of money to buy a 50mb hard-drive. Not only do customers have a generous amount of storage in their smart-phones, they also have a decent amount of processing power. Both processing and storage is multiplied by an infinite amount through cloud computing. Therefore I should be able to store anything and everything relating to our relationship. Similarly the processing power available to me through your organisation should mean that everything is available on demand. The only limit to access will be speed of available Wi-Fi or mobile internet. If either of these aren’t available then appropriate local caching should support my immediate needs. 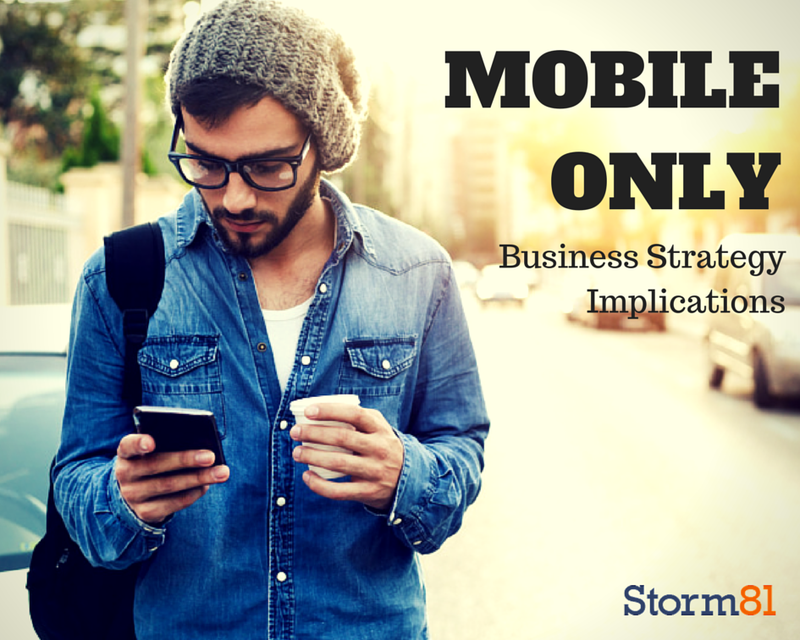 I think “mobile only” is a really valuable lens to place on the business strategy. It forces us to ask tough questions of all the stages of our customer journey. It’s also something that is affecting a broader segment of customers from teenagers on the move to busy executives who only get time to check critical messages between meetings. So how does your customer experience measure up when the only channel into the business can be held in one hand?